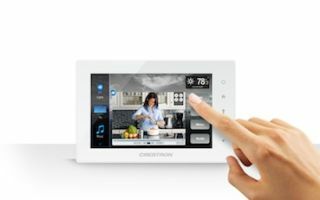 Crestron has released the 5-inch TSW-550, the newest and smallest addition to its Core 3 UI powered family of smart phone and tablet styled touch screens. TSW-550 joins the previously released 7-inch TSW-750 and 10-inch TSW-1050 to complete the versatile touch screen family. High resolution graphics and colors bring Core 3 UI graphics to life with this next generation of dynamically rich user interfaces for controlling the home or commercial environment. Featuring an ultra-bright display, capacitive touch screen technology, PoE, H.264 streaming video, and edge-to-edge glass. The TSW family provides the same high performance control as larger touch screens, with a consistent elegant look, the company says. Capacitive touch offers fast, highly responsive finger touch action, making TSW as simple to navigate as a smart phone or tablet. It's easy to adjust and monitor any system including heating and cooling systems, lighting, video conferencing, multiroom audio, security cameras, and any other connected device. Powered by Core 3 UI graphics, users can interact with dynamic GUI effects and gestures navigation to swipe, scroll, drag, and drop. Cool kinetic effects bring controls to life when using custom knobs, sliders, and gauges. Five soft-touch buttons provide quick access to commonly used functions. Pre-labeled with icons for Power, Home, Lights, plus Up and Down functions, each button is programmable by the control system for custom functionality and added one-touch convenience. Exclusive Rava SIP Intercom technology enables hands-free full-duplex VoIP communication between any two Rava-enabled Crestron touch screens and third-party door stations. Telephone and group paging service lets you communicate with anyone inside or outside of the home or across the world. High-performance H.264 streaming video capability enables crisp and colorfully vivid viewing of streaming video on the razor sharp high-definition display. Users can view content from media servers, including the Crestron Network Video Streamer, security cameras, web cameras and other H.264 streaming video sources. PoE connectivity simplifies installation for both new and retrofit applications. All control, video, intercom, and power signals are transmitted over a single Ethernet wire with one connection, eliminating the hassles of pulling bundles of wire through walls and floors. By obtaining operating power through the LAN wiring, PoE technology eliminates the need for a local power supply or any dedicated power wiring. TSW-550 installs easily with the included post-construction bracket and can be neatly and quickly attached directly to drywall and other surfaces. TSW magnetically adheres to its mounting bracket, eliminating any visible screws to provide a clean, hi-tech appearance in any interior design. For added design versatility, optional tabletop mounting kits are available for all TSW models.